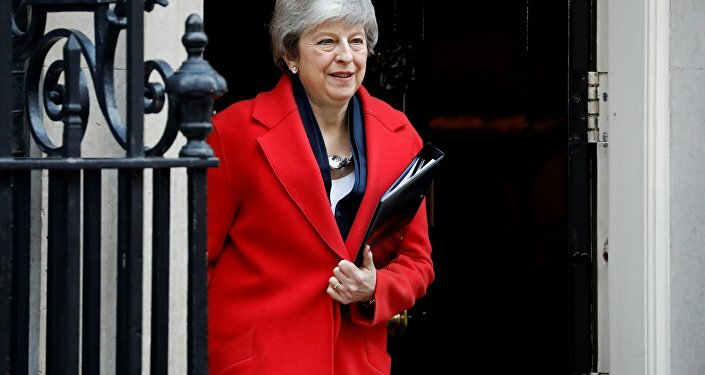 A short extension to the March 29 Brexit deadline will give UK lawmakers extra time to make a final decision that falls in line with the results of the 2016 EU membership referendum, UK Prime Minister Theresa May said on Thursday. Sputnik spoke with journalist Marcus Stead to discuss the recent developments around the Brexit deal. Sputnik: Will Theresa May’s deal finally get through parliament, and if it doesn’t what do you think the outcome will be? It’s been a chaotic few days and I think the best thing we can do is take a moment to look through the mist and examine exactly where we are with the Brexit process. On Wednesday Theresa May sent the letter to Donald Tusk, the President of the European Council requesting an extension to Article Fifty until the thirtieth of June this year; that’s what it said on the letter, and the last time I appeared on Sputnik I urged caution and said that we shouldn’t take for granted that the extension will be agreed. Today; Theresa May will have the opportunity to face the European Council, and the indication that’s coming from the EU, is that the short extension to Article Fifty will only be accepted if its purpose is to implement Theresa May’s deal once it’s been approved by the House of Commons.Even this should not be taken for granted; all twenty-seven EU member states need to agree to that, and we’ll know the answer to this either later today or tomorrow. All it would take is for one to break rank, and there have been hints in the past few days that the likes of Angela Merkel of Germany, and Emmanuel Macron of France aren’t exactly enthralled with the idea of an extension, but perhaps we should be keeping an eye on how some of the less well known EU leaders are reacting, such as Italian Prime Minister Giuessepe Conte or Viktor Orban of Hungary, neither of whom are exactly friendly to the EU establishment. Not enough emphasis is placed on what the EU makes of all this, by the mainstream media in the UK. Some of the mood music coming from Brussels is that they are getting pretty sick of the whole Brexit business, to put it frankly, and they want it over and done with because it’s holding them back from dealing with their other priorities.They are also not overly keen on this May’s European Parliamentary elections, because it would be very likely indeed that Nigel Farage’s new Brexit Party would do extremely well, and that would have all sorts of ramifications, as well as being highly embarrassing for the political establishment. Let’s assume for a moment that the extension of Article Fifty until June is granted; on condition that its purpose is to implement Theresa May’s deal, and that takes us right back to the problem of getting it through parliament. We saw at the start of the week how speaker John Bercow through a spanner in the works, when he said that the same piece of legislation could not be put before the house again during this parliamentary session, unless it was significantly amended. It’s effectively the gift of speaker Bercow; whether the legislation can be put before the house at all next week, and it may be that some clever rewording is not enough and that there has to be a change in substance. If that particular hurdle can be cleared, and that in itself is a big if; then Theresa May can quite reasonably present it to the house on this occasion, as a choice between her deal and a no deal Brexit, because that in effect is where we are. The crucial component in all this, is getting the DUP MPs on board; they’ve been propping up her government since the 2017 general election, and they have significant concerns over the Northern Ireland backstop, but if those concerns can be alleviated, it’s very likely that a significant number of Conservative MPs who have previously rejected the deal, will fall into line. The Labour MPs are likely to be on a three-line whip from Jeremy Corbyn to vote against the deal; but the whipping system in parliament seems to have all but collapsed in all sides of the house anyway, so if a small proportion of Labour MPs see it as a choice between Theresa May’s deal and no deal; it may well help get it over the line. If it’s put before the house next week; we are going right down to the wire, it’s entirely possible that the Article Fifty extension to June is entirely conditional, on it being to implement Theresa May’s deal, so without that deal getting through the Commons, it’s entirely possible that the UK will leave a week on Friday at eleven pm. There’s also been a lot of talk about the so-called incremental votes in the House of Commons if Mrs May’s deal is rejected next week; but I caution against this, when are they going to find enough time to have all of these debates and votes between now and next Friday? Secondly; looking at all the options, there is nothing close to a parliamentary majority for any of the options, whether it’s revoking Article Fifty, or a second referendum, or a lengthy extension to Article Fifty, and the Conservative Party are particularly cautious about this, so there are two options; Mrs May’s deal, or no deal, nothing else is on the table now. Sputnik: Has the political elite betrayed the British public during the Brexit negotiations? Marcus Stead: From the moment Brexit negotiations began; the whole process has been handled appallingly by Theresa May and her government, and the public is finding the whole process embarrassing. If we go all the way back to the beginning; she became Prime Minister, not through a proper leadership contest, but effectively by a coronation, all the other candidates quickly fell away, she was the only one who wanted the job and was willing to take on the job. We had a situation where the new Prime Minister supported remain all the way through the referendum, and she was being asked to take charge of the whole Brexit process, well that in itself was absurd. Her heart was never in it and she gave most of the key cabinet positions to other remain supporters; the civil service, her closest advisors, they were almost all remain supporters, so from the outset these people at best regarded Brexit as a case of damage limitation to the UK, rather than as an opportunity to cut ourselves free from the miserable bureaucracy of the EU, and to form stronger links with the wider world.